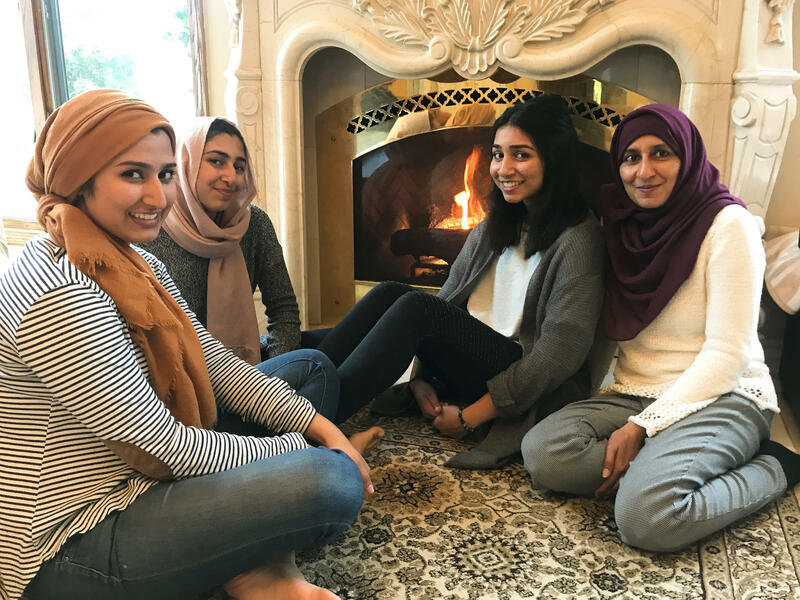 Noshaba Afzal (right) — with daughters (from left) Maimona Afzal Berta, 23, Sana Afzal, 16, and Honna Afzal, 18 — says bullying of Muslims has become a "safety issue." "It was bad, horrible," she said. As she retells the story months later, she trails off and starts to cry. Going from middle school to high school is always hard, figuring out who to sit with, making friends, etc. But doing it as a Muslim kid of color who covers her hair is even harder. More than 42 percent of Muslims in the U.S. report bullying among their school-age kids, according to the Institute for Social Policy and Understanding, a think tank that researches issues that affect American Muslims. And in California, it's more than half, according to the Council on American-Islamic Relations. And with the rising anti-Muslim hostility, the Islamic Networks Group, an advocacy organization that counters religious bigotry with education, says bullying is becoming almost the norm for Muslim kids. The Afzal family says they are facing that anti-Muslim sentiment in many parts of their lives: at the daughters' schools and in the efforts to build a mosque where the community can pray. But they're dealing with it by telling their own stories through educating administrators, classmates and neighbors. "It was tough. You know, in our days, it was — you get slapped with 'kick me' signs," Sana's mother, Noshaba Afzal, said. "But it wasn't a safety issue." Noshaba worried about her daughter's safety especially after incidents like one in Portland, Ore., in 2017, when two men were killed protecting a Muslim girl from an attacker. So Noshaba helped her daughter figure out how to respond to the bullies. They chose education. The Afzal family contacted the school and two advocacy organizations, including the Islamic Networks Group or ING. "They deal with situations where they are being targeted or called terrorists. In some situations, this actually comes from the administrators and teachers," said Ishaq Pathan, who runs the youth programs at ING. He worked with the school to create a presentation about inclusion and understanding people's differences, including Muslims. Now it's a model that ING pulls out when other schools ask for help — a half-dozen times so far. "The main thing that we're focusing on is religious-based bullying," Pathan says. "And a lot of what we believe is that religious-based bullying is based on ignorance and miseducation." This year, the school says, it has pulled the offending article from the English class. And Sana says things are better. Her battle is mostly over, but her family's and her community's is not. The family of six prays in a remodeled barn in nearby San Martin with the South Valley Islamic Community. The community has been trying to build a mosque with a community center and cemetery for years, but the project has been a lightning rod. Noshaba remembers the first land-use meeting at the City of Santa Clara Planning Commission in 2012. "Person after person got up and just blasted," she said, " 'we don't want them here. They're bringing Sharia law. You guys are terrorists.' "
The rhetoric was shocking, she says, interspersed with concerns about the building's environmental impact — an issue often raised to block mosque construction. Since then, it has been six years of legal back-and-forth. Noshaba says you have to make a choice at moments like these: Accept it, or say: "No, this is not the America we want it to be. And we know America can be what we want, where it's inclusion and it's our rights. And we just want to practice." The opposition has been led by the People's Coalition for Government Accountability and the Gilroy-Morgan Hill Patriots. But Georgine Scott-Codiga, who speaks for the Patriots, says it's not about Islam. "The bottom line is these people came and bullied themselves into the neighborhood," says Scott-Codiga. "All the traffic, all the cars, the noise. We want to protect that land." And, she adds, she understands why people are worried about Muslims changing "the way of life." The Patriots post anti-Muslim rhetoric on its Facebook page and have invited an anti-Muslim speaker, Peter Friedman, to present on his views that Islam is a threat to America. In 2012, the planning board approved the permit for the Islamic center — and then was sued. The South Valley Islamic Community voluntarily gave up the permits and started the process again, this time with pro bono legal help. The group says the wider community is supportive, but the opposition is loud and trying to bankrupt it before the mosque can be built. Meanwhile, Noshaba's eldest daughter, Maimona Afzal Berta, is a 23-year-old special education teacher in San Jose, Calif., who also wears a headscarf. She says the bullying and problems started for her in fall 2016. "I'd hear someone shout from outside my classroom, you know, say, 'You're working with ISIS or you're a terrorist,' " she says, recounting the bullying this spring. Others would bang on her windows and doors, and some would say "shoot her" and motion like they were firing a machine gun. She talked to the administrators, and Maimona helped them put together a program to teach kids about inclusion and celebrating diversity. "So at the end of that school year, it was like, 'wow, like, we made some progress,' " she said. And so last fall, she was excited to start teaching again. She showed up early to her classroom at Fischer Middle School on Sept. 11 to prepare for a lesson. But as she turned the corner to her classroom, she saw hate. "And I find the windows and doors vandalized with words associating me with terrorism," she says, stopping to gather herself, crying as she recalls the vandalism. "You know, 'ISIS,' just like very hateful words — profanities. And I was just like shocked." Maimona went to the school again. She says an administrator asked whether she wanted to change schools. "Your solution is essentially to get rid of me?" she said. "I'm not the issue here. It's not even these students. It's the fact that we haven't done a good enough job of educating our students." "She has such great courage to speak up against the injustice that she had experienced specifically here at our school," she said. "And school is, you know, school is supposed to be a safe place for everybody, right?" She says children mimic what they see around them, and she believes it's no coincidence that this started happening at a time that Donald Trump started professing not only anti-Muslim sentiment but also rhetoric against immigrants and other minority communities. Maimona says she realized that if this was happening in her school, a place with a majority student body of color, then it was happening other places, too. So when a seat on her neighborhood school board opened up, she applied. In front of an all-male board, she made her case. "I am the granddaughter of a refugee and an orphan who fulfilled his dreams in this country through an educational experience," she told them. She was up against five other candidates all vying for a seat vacated by a board member on the Franklin-McKinley School District board who had been accused of corruption. At first, it was a tie between the two female candidates. And then Maimona was chosen. She went to the podium and was sworn in. And the men on the board all welcomed her, telling her they were excited to have a woman of color among them. She did this, she says, not only to change things for herself but also for her younger sister, for other Muslim families and for any child who feels like an outsider. "I'm just honestly in shock," she said after being sworn in just over a week ago. "I mean. I've never seen a board member who looks like me. It seems like a dream right now." NPR's Leila Fadel traveled across the country to meet young Muslims expressing themselves in new ways. You can see more from her Muslims in America series here and in the May issue of the National Geographic.